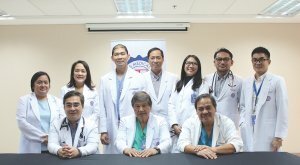 St. Luke’s Medical Center – Global City’s pioneering team of Philippine LVAD implantation: (L-R seated) Dr. Donald C. Cristobal, Cardiologist and Echocardiographer, Dr. Jorge M. Garcia, Cardiac Surgeon, and Dr. Joseph B. Barril, Cardiac Surgeon, together with (L-R standing) Dr. Maria Paz Mildred F. Luque, Cardiac Rehabilitation Specialist, Dr. Nancy Borja-Chio, Cardiac Intensivist, Dr. Roger Michael I. Lim, Cardiac Surgeon, Dr. Michael L. Villa, Endocrinologist, Dr. Guinevere D. Agra, Pulmonologist, Dr. Vimar A. Luz, Nephrologist, and Dr. Ryan M. Llorin, Infectious Disease Specialist. For years, a 70-year-old patient had been suffering from heart failure. Even a few steps would leave him breathless. He also experienced shortness of breath whenever he laid flat, and required five pillows to prop him up in order to sleep. He had fluid build-up inside his lungs and severe kidney damage. After years of feeling depressed and hopeless, only one option remained—implantation of a left ventricular assist device (LVAD). The left ventricle — located at the bottom left portion of the heart —is the most muscular chamber because it pumps oxygen-rich blood out of the heart and circulates it throughout the entire body. “An LVAD implantation is a surgical procedure used to restore heart function and blood circulation inhibited by severe heart failure. It is a battery-powered mechanical pump that is surgically implanted into the chest and abdomen,” says Dr. Donald C. Cristobal, St. Luke’s-Global City Cardiologist and Echocardiographer. (l-r) The core surgical team of Philippine’s 1st LVAD implantation: St. Luke’s-Global City’s Cardiac Surgeons, Dr. Joseph B. Barril and Dr. Jorge M. Garcia, together with Dr. Donald C. Cristobal, Cardiologist and Echocardiographer. The challenge, according to Dr. Cristobal, was the fact that the patient was no longer fit to fly abroad due to his medical condition — yet no one had performed an LVAD implantation in the Philippines before. 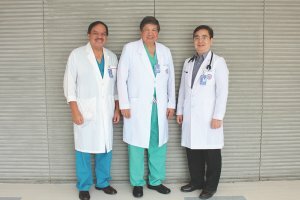 Dr. Cristobal, in consultation with Dr. Jorge M. Garcia and Dr. Joseph B. Barril (two of the small group of Filipino Cardiothoracic surgeons who are internationally trained in all aspects of heart transplantation), suggested the possibility of performing the LVAD procedure locally at St. Luke’s-Global City. “Our team sat down with the patient and his family and presented the risks as well as benefits of the procedure. Once we got the consent of everyone, I gathered my team for this groundbreaking heart surgery,” recalls Dr. Cristobal. The LVAD team is a full army that includes Cardiologists, Cardiac Surgeons, Cardiac Anesthesiologists, Intensivists, Electrophysiologists,Pulmunologists, Nephrologists, Endocrinologists, Cardiac Rehabilitation Specialists, Infectious Disease Specialists and Clinical Nutritionists. On August 29, 2017, the pioneering team performed the Philippines’ first implantation of LVAD, which lasted about four hours. “Unlike artificial hearts, an LVAD does not replace the heart, but supplements its pumping function previously weakened by heart failure. 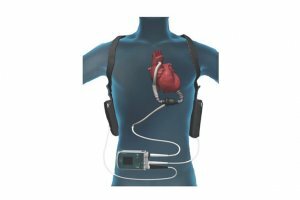 An LVAD can be used in patients who are awaiting heart transplantation, as well as patients who cannot undergo transplantation because of comorbidities. With the availability of this procedure here, I am glad that advanced heart failure patients will no longer need to travel abroad to get this implant,” says Dr. Cristobal, who looks forward to making this procedure broadly available in the Philippines. Indeed, the LVAD can greatly enhance one’s quality of life. Dr. Cristobal reports that after three weeks of cardiac rehabilitation, the LVAD recipient’s kidney functions have returned to almost-normal. Even the swelling of his lower legs has disappeared. Most importantly he can now move around with minimal assistance and no shortness of breath. These days, the patient is now comfortable with the fine cable that connects his LVAD through the skin to a controller outside of his body. The controller senses the function of the LVAD and regulates the power needed to make it work. It connects to an external battery pack wrapped around the patient’s waist. 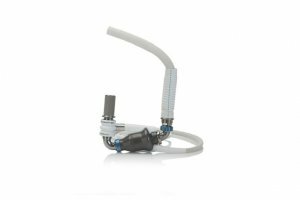 “The LVADs that are available now are very reliable and can support patients for years. Should the battery start to run low, it will trigger an alert to let the person know that it needs changing. An additional battery is always connected to the controller, so if one battery runs down, there is another to power the LVAD for several more hours. Indeed, technology has come a long way in the past years and I am looking forward to further improvements in battery technology, so that soon, these patients will carry LVAD longer with smaller batteries, making the device lighter and a lot more portable,” says Dr. Cristobal.